SPRING…. Creative, Fresh & Renewed. Just like the plants in springtime, we see the seeds of our creative team’s ideas sprout, bloom and grow into what we proudly present as our Spring/Summer 2017 Kevin’s Catalog. As we look back on the season of preparation for this catalog, we remember and appreciate not only each of our Kevin’s team members’ hard work and dedication to the project, but also the many petals of creation that we have come to see as the equivalent to the wonder and beauty of a flower. If only it was as easy as nature makes it look! Do you ever flip through a catalog and totally miss the good stuff? Well, don’t miss the Kevin’s custom crafted Italian Pewter Collection that is found ONLY at Kevin’s! Kathleen and Rebecca met with an artisan from northern Italy and he put their ideas into production. After 2 years, the true essence of the Longleaf Pine and Bobwhite Quail of South Georgia was perfected and this beautiful line of pewter was launched. The term “Tweed” was coined quite accidentally in 1826 as the result of a misread label on a shipment of woven wool “Tweels” – the Scots dialect word for twill – from weaver William Watson & Sons of Commercial Road, Hawick, to a London cloth merchant. The word “Tweel” had perhaps not been written clearly on the label but to the merchant “Tweed” made complete sense as these fabrics were chiefly used in those days by gentlemen for shooting and fishing, with the nearby river Tweed being a fashionable destination for such pursuits. YAY for me, it’s my birthday! Well, my half birthday with Kevin’s, that is! I have soooo enjoyed working at Kevin’s for the past 6 months. And as I was talking with Kevin and Kathleen about how much I have learned about their business since I started with them, it occurred to me that this is something to BLOG about! Every President’s Day, a 99 year tradition takes place on a member plantation of the Georgia Florida Field Trial Club in the Red Hills Region. 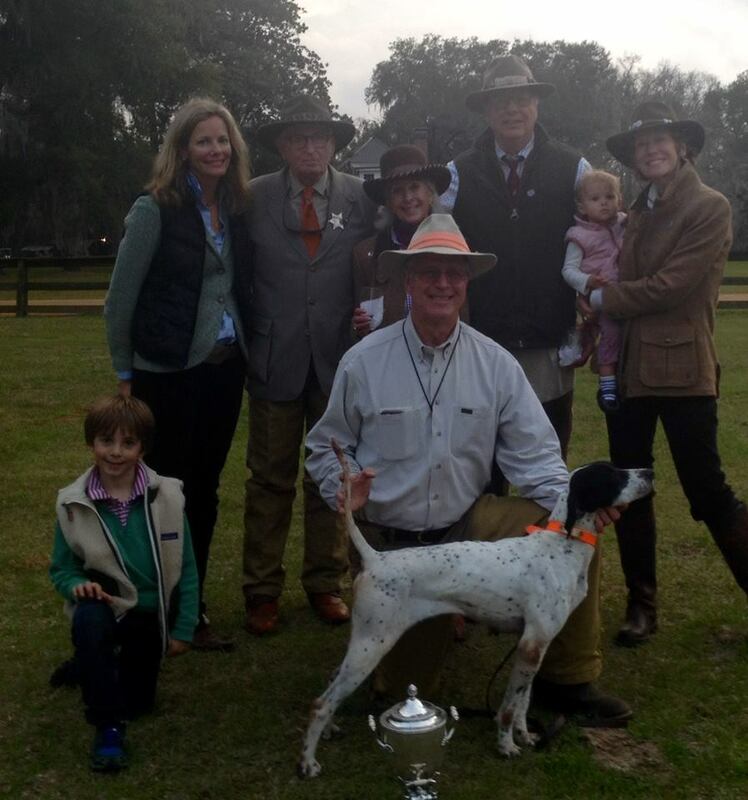 Members gather to celebrate their wild coveys of quail, family friendships and rivalries that have spanned generations, and most importantly, their beloved bird dogs. Since 1916, Club members have come outfitted in their finest, from riding boots to the feathers in their hats. Even their handsome wooden quail wagons are shined for the occasion. While there are many member spectators, only 24 member plantations can run a dog, split up into twelve braces of two. 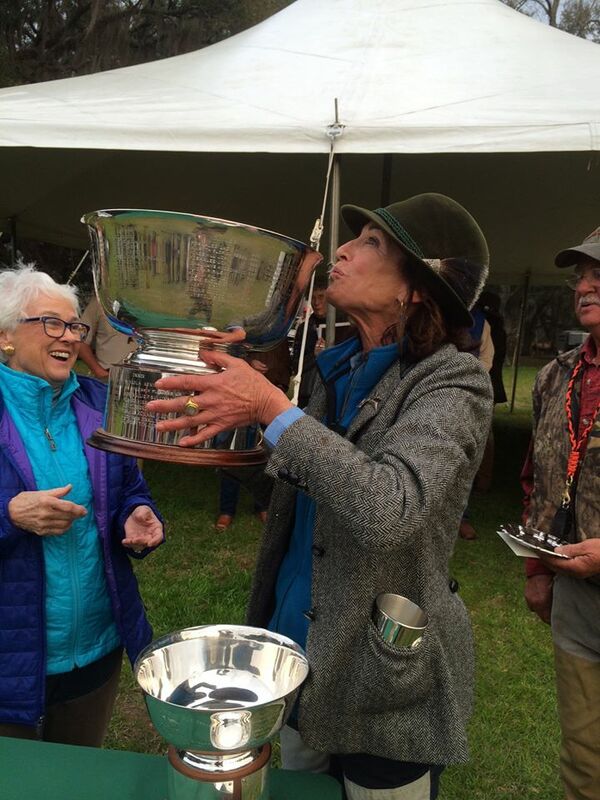 Imagine a day long hunt with plantation owners mounted in wagons and on horses underneath tall pines and amongst the wiregrass, competing to take home the coveted title of best bird dog. Two judges, one from the Club and a non-member, set out on their horses with the gallery to judge the best pointer. The judges count and score each dog’s points and honored points over a thirty minute window. As a point occurs, the dog’s owner shoots a favorite gun in the air to break the covey and move the dog on. Midday, everyone breaks for lunch on a scenic piece of the plantation where the Club dines under a massive white tent and speculates on who has brought the best dog. After lunch, the Club parades back into the pines where the second group of bird dogs perform. After the last brace, the Club makes their way back to the tent where the winners are announced and the plantation owners with the top three dogs are awarded trophies. Congratulations to this year’s winner! 1st Place: Kathy Folsom, 2nd Place: New Hope Plantation and 3rd Place: Melrose Plantation. 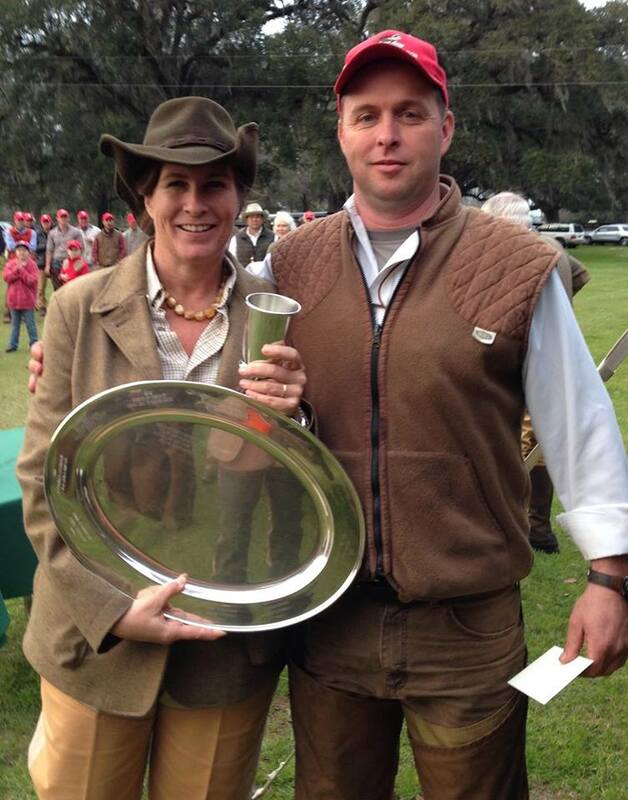 Kevin’s salutes the Georgia Florida Field Trial Club for the traditions they’ve upheld for over a century. They’re fine stewards of the land, love the wildlife and working animals that make it enjoyable, and make running around in the woods fashionable – a few of our favorite things! Chloe joined the Kelly family at Christmas and loves visiting the stores and catalog. She was helping us today with Fall 2014 Mountain Khaki selections! A great day of duck hunting! Her soft southern drawl pulls you gently in as you talk to Kathleen Kelly. Tall and slim with a big smile, she is kind, polite and always sees the good around her. Co-owner of Kevin’s Fine Outdoor Gear & Apparel and Kevin’s Catalog, Kathleen never seems hurried or too busy to take a moment to talk to you. Her family hails from Rome, GA but she grew up in Pensacola, Florida with family ties to Alabama as well. Kathleen grew up hunting on the Quail Plantations of Florida, Georgia and Alabama and ran barefoot on the beaches and bay of Pensacola. She smiles when she talks about how fun it was always being outdoors and being surrounded by strong southern women who always seemed to fill her home with delicious food and friends. Dogs, food, family and southern traditions still move Kathleen and are the foundation of Kevin’s success. For over 40 years the family owned business has become family to many generations of southern hunters and outdoor men and women. Fourth generation southern, Kathleen received a degree in political science with a minor in history and communications from Florida State University. She still talks to her Kappa Delta sisters today and will talk football with the best of them – like all true southern women she is every bit as well versed as her male counterparts! When planning personal or professional events, game day schedules are always considered! Kevin is also a FSU alum but their son is now a War Eagle, and their daughter is looking at a number of SEC colleges which only expands their love of college football. 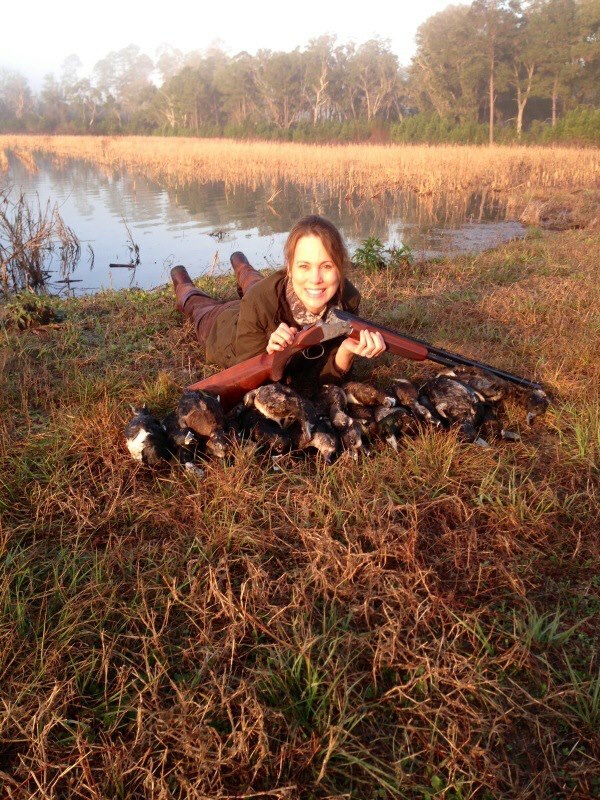 When asked about her southern heritage and the traditions she finds most important, Kathleen reminisces about enjoying a casual coastal lifestyle, hunting and food, family, friends and of course their many dogs. Memories as a young girl are filled with stories of the beach and the hunt, large suppers, beautiful china, elegant table settings with incredible food, sharing recipes and laughter at the table of her family and friends. The thought and details put into every event dominate her experiences, yet she laughs a soft laugh when saying the dogs still ruled the house and the nicest outfits were accessorized with dog hair! 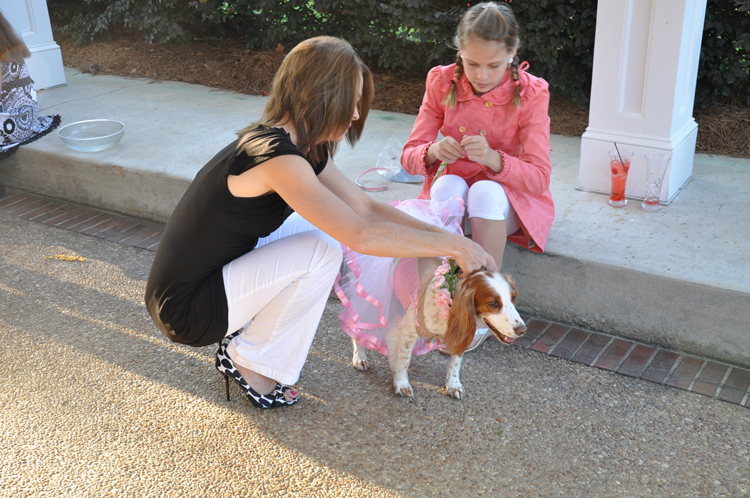 Maggie looks great in Anna’s Tutu! Kathleen and Anna enjoy dressing up and dressing up Maggie too! It’s no wonder that she designs many of the different clothing lines, and selects with loving care the home goods found at Kevin’s. She grew up in the field and knows what the true outdoor person loves, how they wear it and how the fabrics and construction must perform. Quality is king to Kathleen, she expects it for herself and especially for her customers – many who shop worldwide with Kevin’s. Her background after college was in marketing for the new Florida Lottery and Ernst & Young as a consultant. Lessons learned very early were if the customer isn’t happy then she has not done her job –and every day, this is the questions she asks of her staff, is Kevin’s giving their customers a great shopping experience? 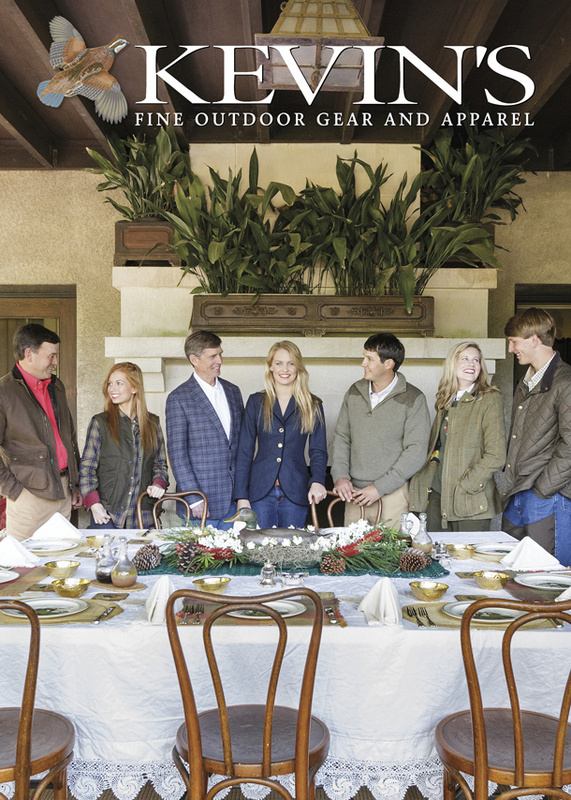 So much of the southern lifestyle Kathleen grew up with and lives every day is about entertaining. It’s about home, family, friends and gathering together. The cookbooks sold at Kevin’s have been tested by Kathleen, she cooks and entertains often. She knows the best recipes! The bridal registry is a favorite for southern brides (and grooms too with their extensive hunting and fishing departments) ; where else will you find such a beautiful selection for your home? 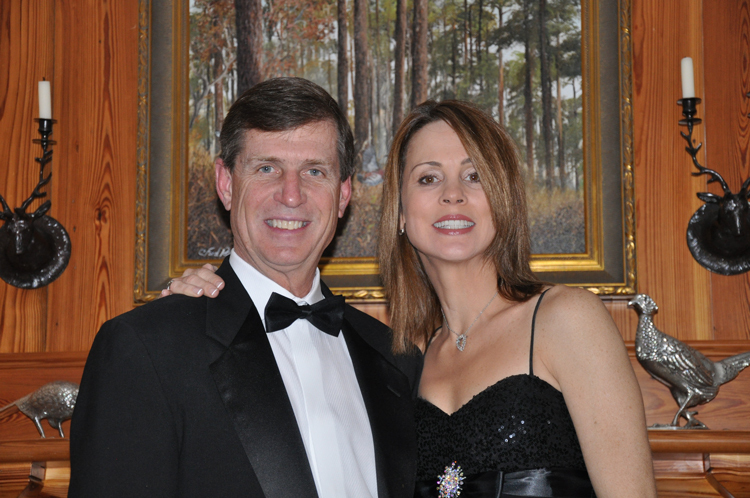 Kathleen Kelly, co-owner of Kevin’s is the quintessential southern woman. Kevin’s is a reflection of her deep rooted southern lifestyle, her gracious love of entertaining and her love of creating gathering places for friends and family. Stop by, she will spend the time to get to know you without rushing or worry, because it’s all about you. It’s not surprising that people fly in from everywhere (even across the ocean) to shop at Kevin’s! Quintessentially Kathleen! This beautiful setting was created for Kevin’s Catalog but it reflects the southern lifestyle and traditions Kathleen embraces. Friends and family together. When it comes to quality shooting shirts, Kevin's is the top of the line. We focus on making comfortable clothing that performs well so you can focus on one thing... That 6 oz. bird!! 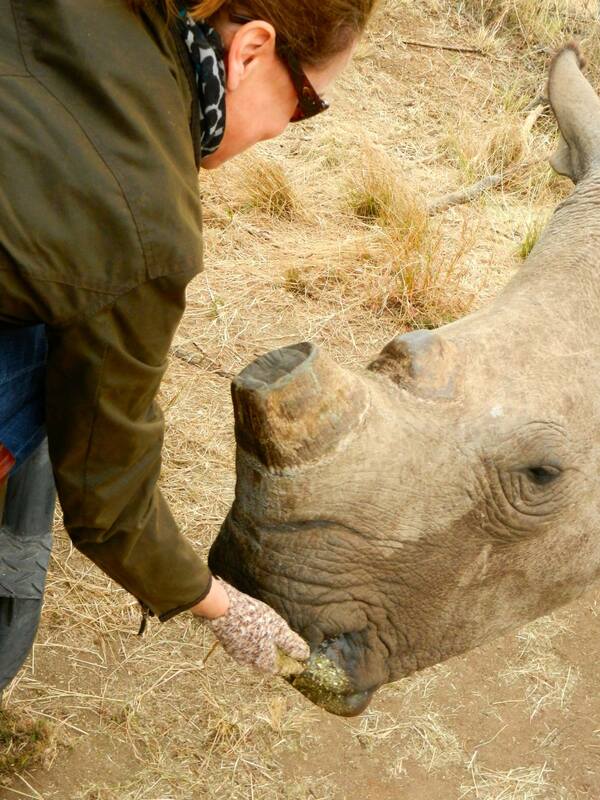 We are huge proponents of land and water conservation because we have a special love and respect for nature. We promote responsible hunting and fishing practices and do what we can to help educate those around us. We will continue to support conservation organizations with manpower and monetary resources to protect these beautiful lands we call home! If you took a trip to throw some lines here, who would you take? When hunting, it's not uncommon to see some rather, well, uncommon things. This is definitely something I've never seen in person yet... A gobbler with a condition known as leucism, resulting in a partial loss of pigmentation. Congrats to Cameron Bond of Warren County Tennessee. Sunsets of Georgia and Florida are the perfect start to this Easter weekend! #colemanlantern #vintage #coleman . . . . . #nature #naturelover #easter #celebrate #family #getoutdoors #sunsets #sunsetlover #godbless . . . .
Spring is such a wonderful time of year, full of beautiful colors and new life! !